← If you drive a SUV, you need to plant 127 trees a year! Personally, I’m sick and tired of noisy leaf blowers disturbing the enjoyment of beautiful days. It has gotten to the point where one cannot keep their windows open or sit on the deck without these infernal things droning on and on well above any allowed or acceptable noise decibel. Furthermore, their exhaust fumes increases air pollution. And when they stir up dust, pollen, and mold spores, leaf blowers aggravate the allergies in those of us who suffer from such maladies. 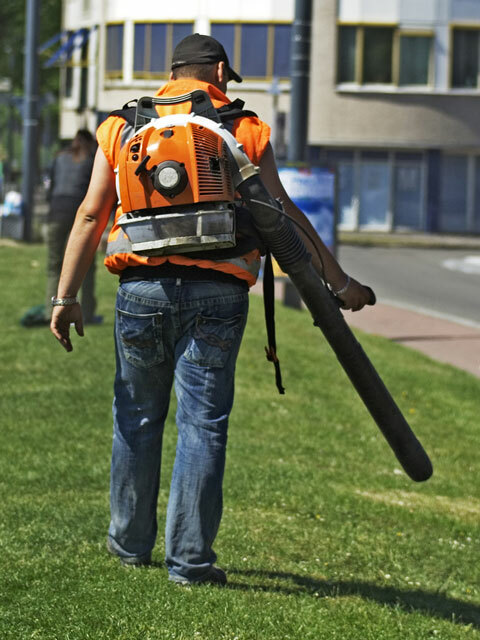 According to the Centers for Disease Control, leaf blowers typically produce at least 90 decibels of noise – exposure two hours of such noise causes permanent hearing loss. Edmunds Automotive found a two-stroke commercial leaf-blower produces as many hydrocarbons emissions in 30 minutes as a F-150 pick-up truck does driving 3,887 miles! The Edmunds study also showed that a gas-powered leaf-blowers two-stroke engine emitted nearly 299 times the hydrocarbons of a pickup truck and 93 times the hydrocarbons of a sedan. A study by the U.S. Environmental Protection Agency entitled, National Emissions from Lawn and Garden Equipment, indicates that gasoline-powered lawn and garden equipment is a prevalent source of toxic and carcinogenic emissions. A number of cities across the country have banned or limited the use of commercial gas-powered leaf blowers (see list below). The first to do so were Carmel and Beverly Hills, California in the mid-1970s. Examples can now be found in New York, New Jersey, Massachusetts, Illinois, Colorado, Arizona, Oregon, New Hampshire, Hawaii, Texas, and Florida, as well as many other communities in California. While I don’t expect the EPA to do anything worthwhile under the current administration. Hopefully more cities, including Traverse City and Tucson, will join the list below, as these mechanical beasts, gas-powered ones in particular, are quite the menace to human health and peaceful enjoyment of our homes and communities. Peace. This entry was posted in Advocacy, Alternative energy, environment, health, landscape architecture, nature, peace, planning, pollution, product design, seasons, Statistics, sustainability, technology. Bookmark the permalink. 9 Responses to It is Time to Ban Gas-powered Leaf Blowers! I’d ban most leaf-blower use, as well as all the gas-powered ones. I see much waste and damage from the blowing itself, regardless of fuel source. People using them on wet leaves. Use where much topsoil is also blown away. People using them to clear snow off pavement and car roofs! One motive for their use is sheer laziness – with NO experimental verification that leaf-blowers take less time to do the job. Doing the job includes confining the chore to what must be done, minimizing collateral damage like topsoil loss or blowing leaves where you don’t actually want them. Another motivation is showing how macho the human operator is; unfortunately a lot of leaf-blowing is done by male employees from Latin-American cultural backgrounds which put big stock in machismo. This is good news. Personally I cannot stand these machines, and very often the material being blown goes to the “other side” – into someone else’s place! You don’t expect the current administration to do anything? You mean the Republicans? Well, friend, nothing was done during eight years of the previous Democratic administration either. Consider, local governments could take the initiative, muster public support, and ban leaf blowers yet apparently make up for their lack of political courage with endless rhetoric and virtue signaling. I see we’re still on this topic, and will be for a long time. I won’t repeat myself. One really bad use of leaf-blowers is in my co-op, where janitors use leaf-blowers to clear snow from the exposed back stairwells and porches. Instead of just moving the snow downward to the sidewalk to be shoveled away, the leaf-blower send snow in all directions, so that it is plastered on our back doors and windows. This would happen even with electric blowers. This also sends exhaust from the gas-powered blower into our apartments via the cracks around the back door, since our buildings have continuous exhaust through bathroom vents. It snowed a little the other day, and I went out and used one of my cheap old ratty brooms to sweep the snow downward off the stairs and porches. Do you happen to know if there are any flyers, info leaflets of health hazards printed in Spanish? The vast majority, if not all, of the workers in my area are not native English speakers, and many of them do not speak much English. It is a great disservice to them to not tell them, in their own language, what exactly they are risking. Thanks! Good question. I haven’t seen any, but will look. It is a beautiful day here in Falmouth Maine. We get so few this time of year. However I cannot go outside or open my windows because leaf blowers have shown up next door at the church. They have been there about 2 hours now and have done only about 25 feet and have probably another 150 feet to go. I think I’m gonna snap!! I’m laughing right now when I saw that Honolulu has a limited use of commercial gas powered leaf blowers. I live in Honolulu (born and raised) and the use of leaf blowers is not just for the yard.. but people actually use the parts to soup up their mopeds. So it is an every day thing here. Why they do it? Who knows, but it smells and is loud as hell. Can you imagine a 400lbs. man on a small moped that sounds like a leaf blower? Yeah, let that sink in.. I live very close to an old folks home and they use a gas powered leaf blower EVERY SINGLE DAY. Twice on Fridays because their landscapers come by every week to do the same thing that they do every day… USE A LEAF BLOWER and gas powered weed whackers. Now, I don’t mind the landscapers coming every week. But this is a very small old folks home where the building can withstand a hurricane while the houses surrounding it all get demolished. Older homes in Hawaii are poorly designed than on the mainland, so you can hear everything that goes on outside with all windows and doors closed. I don’t know if any of you could stand living next to this place, let alone in Hawaii, where you get woken up on the weekends at 9 am to a leaf blower. I have complained to them for 6 years to only get a “we are very sorry for the noise…” but no resolution. My husband has tried to convince them to use an electric leaf blower or to limit the use to once a week only to be fallen on deaf ears. *Maybe the staff are getting old too* I remember when rakes and brooms where used to make your yard neat and clean. Now, we are in an age where laziness is taking over and the mere consideration of others are non existent. Hawaii is my home, but making a move to somewhere else off the mainland or to another country is looking better than staying here. By the way, I am also 6 months pregnant and the noise makes my child move around looking for cover , and the smell makes me sick to my stomach.